This photo was taken at the I.V. 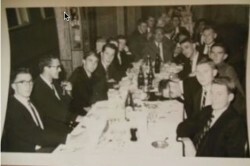 Dinner in 1959. In 1959 the I.V. was held on the gold coast and was hosted by Brisbane.